As a native Venezuelan I keep well informed about the political and social tragedy taking place in our country. Therefore I am shocked by the hypocritical posture of some political leaders who define themselves as progressives. Prominent figures of the Democratic Party such as Bernie Sanders, Tulsi Gabbard, Alexandria Ocasio Cortez and, particularly, Ilhan Omar, have taken sides with the Nicolas Maduro dictatorship, using arguments that are clearly ideological, without basis in Venezuelan reality. When behaving in this manner they go against the principles they profess to cherish: protection of the poor, better health and education services, true democracy. How can they support regimes such as Maduro’s, a functional illiterate, indoctrinated in Castro’s Cuba, a cruel and illegitimate dictator, in the name of their love for the masses? Don’t they know that Venezuela has been run into the ground by sadistic autocrats like Chavez and Maduro? Don’t they know that Venezuelans are being cruelly repressed, that they have been suffering under an inflation of 2 million percent per year and are going hungry, without being able to meet their most essential needs? Have they not heard that this suffering has been going on for 20 years, due to the pretension of these dictators to convert what once was a true democracy into a replica of Cuba’s political nightmare? It terrifies me that men and women such as these are working inside U.S. democracy in efforts to recreate the Cuban and the Venezuelan “paradise” and that they do not keep it a secret. They are leading the pack of populists in the name of democratic socialism, blending acceptable and worthy democratic ideas about social security and equitable treatment for all with demagoguery and populist, insincere promises. Ilhan Omar is a 38 years old member of the U.S. Congress who came to the U.S. as a child refugee from Somalia. According to Wikipedia, see: https://en.wikipedia.org/wiki/Ilhan_Omar , she defines herself as a progressive, democratic socialist. In her short career she has been accused of using public funds for private use. An editorial of the Minnesota Star, a respected, left of center leaning newspaper, warned Ms. Omar to be more transparent about her use of campaign funds. She has also been accused of anti-Semitism, mainly on the basis of a 2012 tweet that reads: “Israel has hypnotized the world, may Allah awaken the people and help them see the evil doings of Israel”. I would have expected Omar, coming from Somalia, to be more sensitive to the plight of Venezuelans, since they have suffered similar tragedies to those afflicting her country of birth. However, according to Wikipedia: “In January 2019, amid the 2019 Venezuelan presidential crisis, Omar joined Democrats Ro Khanna and Tulsi Gabbard in denouncing the Trump administration's decision to recognize Juan Guaidó, the leader of the Venezuelan National Assembly, as the new president of Venezuela. She said that the U.S. should not "hand pick" foreign leaders, adding that the U.S. should support "Mexico, Uruguay & the Vatican’s efforts to facilitate a peaceful dialogue", that Trump's action was a "U.S. backed coup", and that Guaidó was part of the "far-right opposition", a view not shared by most congressional Democrats; Guaidó's party has been described as holding center-left positions”. 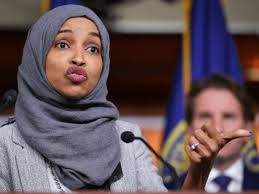 As recently reported by Fox News Ms. Omar has said she does not recognize Venezuelan opposition leader Juan Guaidó as the interim Venezuelan president. For her: “Trump's efforts to install a far right opposition will only incite violence and further destabilize the region. We must support Mexico, Uruguay & the Vatican's efforts to facilitate a peaceful dialogue”. She is wrong on all counts. Uruguay and the Vatican are no longer pursuing a dialogue, after stating that such a path has no moral or strategic merit. Juan Guaidó is not a member of the extreme right but clearly left of center. She is a hostage of ideology when she equates being for Guaidó as being for Trump. Many people who disagree with President Trump on almost all issues recognize Guaidó as the legitimate president of Venezuela, together with 60 of the world’s most important nations. When she goes against Guaidó simply because President Trump defends him she is being intellectually dishonest. Until I read about this posture of Omar on Venezuela I did not know who she was. Now I know more about who she is. She appears to be a fanatic who would try to put square pegs in round holes if doing so serves her ideological purposes. If she was the only one behaving in this fashion in today’s America I would not worry, but this is becoming the norm in the political arena. Many prominent Republican and Democrats are throwing common sense and rationality, ideals and principles by the board in their blind efforts to prove the other side wrong. In doing this they are destroying one of the most successful pillars of U.S. democracy: bipartisanship, the ability to deal honestly and objectively with national issues. This seriously flawed woman should not be in Congress. She represents all the ideas of the enemies of the country and sits in the most important institution of democracy. Let´s hope she is there only for her 2 year period and people see that she is not a decent human being. Este es el caballo de Troya que le están metiendo a la democracia americana para destruirla. Me disculpa, pero estoy muy en desaacuerdo con la comparación en la cobducta entre los republicanos y estos "demócratas" como Inar, Sanders y Ocasio-Cortez. Político es político y ya sabemos cómo son en todas partes. Pero no nos confundamos, esto es otra cosa. Estàn tratando de destruir al partido democrático para luego, si son exitosos, asaltar el poder. Ellos leen encuestas y saben de la desafección de la mitad de los jóvenes por el capitalismo y su preferencia por el comunismo. Esta señora esconde en el hyjab con que cubre el pelo, el arsenal antioccidental que van a usar para dinamitar el sustema. Make no mistake about it. La democracia, una vez más, permitiendo que la destruyan desde adentro. Except for outliers, the real story is the bipartisan consensus on Venezuela. As in the Republican Party, leaders in the Democratic party hace all aligned on the legitimacy of President Guaido and the need for the narco-state to go. It is hard for me to fathom what is in Ilhan Omar's head. The most charitable explanation is that she is just badly informed. In any event, the decent people of Minnesota deserve better. By the way, I would add Rep Ro Khanna (CA-17) to your list. He happens to represent the district where my employer is based and so I have written to him several times. In this case, his agenda seems to be to score political points by visibly opposing Trump on everything. I would personally find it less objectionable if US representatives exercised own objective judgement instead of piling on. In other words, it is still possible to support the current administration and Marco Rubio's well-informed policy on Venezuela, and oppose it on other topics. This is not a binary choice.